SAN DIEGO, California (April 20, 2009) Stemedica Cell Technologies, Inc. (Stemedica), a world leader in stem cell research and manufacturing, announced that the U.S. Food and Drug Administration (FDA) approved an Investigational New Drug (IND) for a clinical trial for ischemic stroke using Stemedica’s high potency proprietary allogeneic stem cells (adult human). The IND application approval allows Stemedica to initiate a planned clinical trial at medical centers within the United States. The clinical trial will be a Phase I/II dose escalation and safety clinical trial using allogeneic mesenchymal bone marrow cells administered intravenously to patients with ischemic stroke. The patient population will include individuals with significant functional or neurologic impairment related to the ischemic stroke that confines the subject to a wheelchair or requires the subject to have home nursing care or assistance with the general activities of daily living. “This approval, along with the licensing of our cGMP manufacturing facility, are two important breakthroughs in our company?s evolution,? said Maynard Howe, PhD, Stemedica?s Vice Chairman & CEO.? “It is a testament to the professionalism and focused persistence of our team. Stemedica is licensed by the State of California?s Department of Public Health, Food and Drug Branch to manufacture stem cells, drugs and biologic products for human clinical trials. The Company is compliant with both California law and the Code of Federal Regulations. Stemedica Cell Technologies Inc. is a specialty biopharmaceutical company that is committed to the development and manufacturing of best-in-class adult stem cells and stem cell factors for use by approved research institutions and hospitals for pre-clinical and human clinical trials. The company is currently developing regulatory pathways for stroke and wound repair. Stemedica is headquartered in San Diego, California. 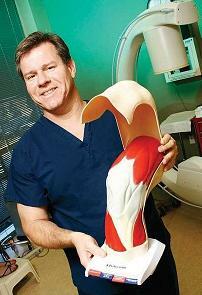 Dr. Centeno is offering stem cell therapies for orthopedic damage with remarkable results. Is this the future of stem cells in the US? The FDA has yet to approve stem cell therapies for general use in medicine, but that hasn?t stopped doctors in Colorado from providing them anyway. Chris Centeno and John Schultz have boldly formed Regenerative Sciences Inc. in Broomfield, Colorado. RSI provides its patients with the Regenexx procedure, an adult stem cell transplant that uses your own cells (autologous) to treat joint injuries and bone damage. There?s no surgery needed. A needle extracts bone marrow, RSI isolates the stem cells and cultures them in your own blood, and then these cells are injected into the area where they are needed. They?ve treated 348+ patients with 800+ injections and show no signs of slowing down. According to RSI?s own surveys, 89% of their knee patients showed marked improvement, as did 75% of their hip patients! Within months some patients can walk or run in ways they haven?t been able to in years. We?ve seen these kinds of results from stem cell treatments before, but only in horses and dogs. That?s because human stem cell therapies like this one aren?t approved by the FDA. How can Centeno and Schultz flaunt the lack of federal approval? They claim that Regenexx is solely used as a part of their medical practice, only within the state of Colorado, and as such is no more regulated by the FDA than it would be by the FAA or the Department of Motor Vehicles. For hundreds of patients, he and his team are providing a remarkable hope. They?ve brought lab-cultured medical stem cell therapies to the US. Finally. Stem cells have been a focal point for hype and hope for years now. Besides healing horses and dogs, they have promising effects on diabetes, corneal blindness, even HIV. It?s pretty clear that they?re also the future of organ transplants. Just the news of a stem cell related development or patent will cause a biotech company?s stocks to soar. The FDA, which regulates all interstate drug sales and related clinical trials is not trying to keep Americans from these ?miraculous? cures, it?s simply trying to make sure they are safe first. Apparently, that?s taking too long. Medical tourism agencies are starting to cater to those seeking stem cell treatments. Whether or not they are ready for widespread medical use, stem cell therapies are in high demand, not just in the US but around the world. It?s no longer a question of when we will have access to these treatments, it?s a question of how. A severely damaged knee healed to a remarkable degree. A severely damaged knee healed to a remarkable degree. Must be stem cells. RSI is offering adult stem cell therapies in the US. That’s an important first, but what will happen without FDA approval? Patient?s interested in the Regenexx procedure face what seems to be a fairly standard experience for autologous stem cell transplants. It takes 20-40 minutes to extract the cells from hip bone marrow with limited anesthesia, and blood is also taken. Over a month RSI?s lab will isolate mesenchymal (multipotent) adult stem cells and multiply them until they have 1 to 10 million. Typically, a patient will receive an injection into the treated area once a month for three months. Positive results are sometimes seen quickly (in 1 to 3 months) but will hopefully develop within 6 to 9 months. Importantly, there?s no down time as a result of the procedure. Patients can leave the clinic and go home after each injection.? A round of Regenexx (extraction, cultivation,? and 3 injections) costs $7000-$8500. Those who produce exceptional numbers of stem cells can use subsequent injections (even in other parts of the body) for around $3500. Most insurances will not cover the treatment. The fact that RSI isolates and cultures (multiplies) the cells is a big difference from other clinics that offer stem cell therapies. That process allows the lab to create enough mesenchymal stem cells? to really have an effect on the area in which they are injected. Many clinics around the world will take blood, marrow, or tissue and then spin out the stem cells in a centrifuge, injecting them back in on the same day. That style? of therapy could possibly be effective, but it is far less likely than with a dose of millions of multipotent stem cells. There are several doctors around the US that will provide such ?single-visit? stem cell therapies, but RSI is offers the lab cultured mesenchymal therapy in the US. Dr. Centeno has confirmed that he?s the only one, that he knows of, openly using this particular procedure in the US. In the past, many have been very skeptical of stem cell treatment centers in other countries. First, let?s look at the success RSI is selling. Autologous transplants are offered in the hands, hips, knees, shoulders, back (non-spinal cord injury), ankles, and bone fractures. For each of these procedures you can find many ardent and exceptionally encouraging patient testimonials on their website, or their YouTube channel, along with a flood of supportive media. Overall, RSI is claiming around 80% patient satisfaction according to its own surveys. That?s incredible, especially when you see some of their patients walking and running again on joints that have experienced years of chronic damage. It also seems Centeno and Schultz have the documented evidence to back up the claims for Regenexx?s success. RSI provides case studies for each of its treatments as well as published scientific research. According to my conversation with Centeno, RSI is currently working on a comprehensive statistical analysis of their more popular treatments so they can publish quantitative results in a peer review journal. In other words, they?ll soon publish the hard numbers ? X% of patients feel Y% better Z months after the procedure. Importantly, RSI seems to be upfront with patients about the limits of their own technique. The website FAQ clearly states that not all results will be like the testimonials, and they even have a dedicated page explaining that stem cell therapies won?t work for everyone. Furthermore, RSI has published the largest study of risks and complications associated with stem cell treatments yet produced in the US (N=227). That paper demonstrates the very low harm associated with stem cell therapies ? much lower than the alternative surgery(published in Current Stem Cell Research & Therapy). Centeno claims that if we?re really worried that autologous stem cell therapies are going to hurt someone, this paper pretty much shows they won?t. The concerns most people have with RSI are not medical, they?re political. Many applaud Centeno and Schultz for supplying the public with the cutting edge technology they demand, but worry about the manner in which it has been accomplished. Skirting FDA approval for a technique through the arguments they use opens the gate to a host of problems. If RSI can provide Regenexx because it is a doctor?s procedure not involved in interstate commerce, does that mean someone else can do the same for another treatment? What are the limits of such procedures? How does a patient know if a doctor?s therapy is safe, or effective, if it hasn?t undergone peer review and government inspection? Doctors and surgeons are developing new procedures all the time. Surgeons will often create new devices for their own use in surgery, doctors routinely try out new dosing regimes, or therapies on their patients. This is part of the medical profession. Still, it?s possible that even though RSI is doing what many other doctors routinely do (develop a new therapy for use in their own practice) that the federal government could try to bring them to court. The FDA seems to have taken the stance that all stem cells (whether used autologously or not) are drugs. As such, they would need FDA approval, and would likely only be developed by large pharmaceutical companies. According to Lee Buckler of Cell Therapy Blog, Centeno?s already received a warning letter from the FDA. Centeno clarified that this is actually an ?untitled letter? which has no bearing on regulation. He pointed me to this explanation on untitled letters. RSI has faced concerns from the New York Department of Health, and went so far as to pursue a provisional license, even though they are no where near NY state. Clearly RSI is hoping to avoid bureaucratic problems or at least be very prepared for them if they do arise.? Perhaps with enough positive results they can avoid legal battles and even convince insurance companies to cover Regenexx. Hopefully so. Just look as these results. They?re pretty damn amazing. If you accept the success rates, and the possibilities for long term healing?many people need this. Centeno says he is working with others to provide the framework through which many more patients could receive mesenchymal stem cell therapies. He?s on the board of the International Cell Medicine Society (ICMS) which is working to track stem cell therapy patients through a registry, as well as certify stem cell clinics for practice. Through conferences and seminars, doctors are trained in IVF to work in fertility clinics. Centeno explained to me that a similar practice could instruct and track physicians interested in providing lab cultured autologous stem cell therapies. In other words, the technique used by RSI could become a regularly seen procedure in specialty clinics across the country. That may mean more patients could have access to stem cells soon. FDA approval is slow, but it?s coming. Athersys has a patent for a stem cell derived drug, other companies have therapies in clinical trials. Those treatments will be here some day. In the meantime, RSI is filling in the gap. Their work may even catch on as a trend. If largely successful, insurance companies may pay for it and the federal government may end up grandfathering Regenexx in at some point. It could happen. What?s certain is that the public demand for stem cell therapies is real, growing, and seemingly justified. When that sort of pressure for a technology exists nobody can keep it down. There is no conclusive understanding of what the long term effects of stem cells treatments will be. We do not know if a stem cell treatment will be effective 5-10 years after it is administered, and we know of no large study that has conclusively reviewed patients for cancer, or any long term side effect 5-10 years after a stem cell injection. Part of what ICMS is trying to do (reviewing clinics, tracking patients results over the long term) may yield a better understanding in the future. ScienceDaily (Apr. 9, 2010) ? A team of researchers at the University of Maryland, Baltimore (UMB), writing in the science journal PLos ONE, have developed a biologic method to tease out which compounds from herbal medicines and medicinal herbal mixtures produce their reputed medicinal benefits such as life extension. “This provides the first step to find, from all of the hundreds of compounds in herbs, which ones have potential for medicinal purposes. And you can do this very quickly and efficiently,” said co-author Laura Dosanjh, graduate student with the School of Pharmacy at UMB. Science has not been very helpful in determining the efficacy of herbal medicines in the United States. The U.S. Food and Drug Administration, for example, has so far sided with science only once to approve an herb-based treatment with multiple active ingredients — an ointment for genital warts made from green tea leaves. Now, using tiny worms that live only 20 days, the team sorted out which compounds found in two common Chinese herbal formulations showed most potential for their stated purpose: extending life expectancy. Cinnamon and ginseng won, showing the most promise. A team led by Yuan Luo PhD, MS, associate professor at the School, conducted a first-of-its- kind, “systematic evaluation” of a mixture of 10 herbs called Shi-Quan-Da-Bu-Tang (SQDB), reportedly effective for fatigue and energy; and an 11-herb formula called Huo Luo Xiao Ling Dan (HLXL) used as a the treatment of arthritic joint pain. Both mixtures are reputed to have benefits for healthy living and longevity in humans. The researchers tested the mixtures, as well as each separate herb in them, on the laboratory worm model C. elegans. This particular worm?which biochemists often use as their ‘lab rat’? shares genes for aging and other traits with humans and other organisms. Cinnamon bark (Cinnamomum cassia) from HLXL extended life span of the worms by 14.5 percent and cinnamon bark from SQDB extended the life 10.8 percent. Ginseng root (Panax ginseng) from SQDB extended life span by 7.7 percent. Ginseng is not an ingredient in HLXL. Significantly, cinnamon, ginseng, and SQDB also thinned out levels of hydrogen peroxide, which can destroy cells. They each also enhanced expression of small heat shock proteins, an indicator for cellular response to stress that plays an important role in maintenance of cell functions. Furthermore, the life span-extending herbs appreciatively reduced in the expression in C. elegans of a toxicity factor, amyloid, which is a hallmark in the human brain of pathological development of Alzheimer’s disease. In a 1998 national survey published in the Journal of American Medical Association, 49 percent of American adults said they had used herbal medicines within the previous year. However, proof of efficacy of herbal medicines, even their modes of action in the body, are extremely difficult challenges, said, Luo. Herbal medicines are usually mixtures of herbs. That presents a severe challenge for the Food and Drug Administration to understand which compounds or combinations of compounds in the herbs are effective or not effective. In recent years, scientists have learned to use C. elegans worm as a model system in for studying gene-environment interactions. In their experiments, the School of Pharmacy researchers first used “wild” C. elegans to screen the herbal mixtures and single herbs. They determined which herbs aided lifespan of the worms, then tested those herbs on well-characterized mutant worms. Each mutant was missing a single gene known for lifespan and/or stress resistance. C. elegans is valuable to science because its very short life cycle is suitable for conducting rapid experiments and between 60 to 80 percent of the 20,000 genes in C. elegans genome have similar origins to human genes. The genes are found consistently along the evolutionary paths including the worms and humans. “The good news is that this is a way of testing to show the medicinal effect. It is now testable. We have statistical evidence for the first time in C. elegans for a multi-compound drug,” said Luo. “Most [scientists] are not using whole organisms for screening herbs. This is simple and clean, it is a system to look at specific genes. Now we have to further validate the human relevancy. The School of Pharmacy study was published in the Feb. 2010 issue of PLoS ONE, Vo. 5.